As a self-proclaimed foodie with a passion for Italian food, it was only a matter of time before I found myself being enticed by the thoughts of making my own pasta. My dreams of homemade pasta were stoked by stories of the noodles made by my grandfather on my mother’s side (who was Italian-American) and my great-grandmother on my father’s side (who was not). In a way, it was a matter of family pride to want to revive and carry on these culinary traditions. 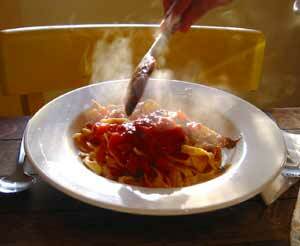 It was also a matter of wanting to recreate the delicious fresh pasta that Jeremy and I had every day in Bologna. And it was a matter of thinking that being able to make my own pasta would be just plain cool. And so it was that on my thirty-first birthday (which, at the time of writing, was just two days ago), my loving husband took me on a tour of all the kitchen shops in Brighton so I could pick out the pasta maker of my dreams. It was pretty slim pickins’, but by the end of the shopping day, I had my gleaming Imperia pasta maker - and a lovely marble mortar and pestle to boot. Happy birthday to me! 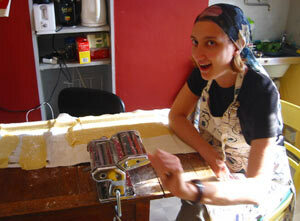 I embarked on my first pasta-making adventure the day after my birthday. As per the pasta machine’s instructions, I did a few trial runs with some throw-away dough to clean out the pasta-maker’s steel rollers, and then I got down to the real thing. First, the dough: two cups of fine Italian flour, 3 eggs, and nothing else. The dough came together very easily, and though I was anxious to get to the rolling and cutting bit of the pasta-making process, I wrapped the dough in plastic wrap and set it in the fridge for a while to “rest”. …and then you discover that it’s helpful to have another pair of hands available, because it’s not so easy to hold the dough and turn the knob to adjust the rollers at the same time. I found the dough to be remarkably resilient though. It was smooth and stretchy, but it wasn’t sticky, it didn’t tear, and it withstood a lot of manhandling. Maybe this was beginner’s luck on my part, but I was quite pleased with the texture of the dough. And then, because the dough is tired from all the rolling, it has to have another little rest on its floury towels. Actually, it just needs to dry out a bit before you can cut it into tagliatelle or spaghetti, or else it will clog up the rollers (a lesson I learned the hard way when I was cleaning out the machine with my practice dough and attempted to put still-wet dough into the tagliatelle attachment - bad move). I didn’t need a rest at this point. In fact, I was so hyped-up by the whole pasta-making thing that I felt to compelled to continue cranking the empty pasta machine’s handle while my dough tried to rest. 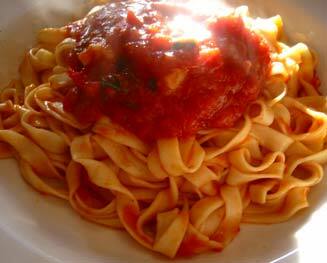 It was tagliatelle! I couldn’t believe it had actually worked. I couldn’t linger over this triumph for too long, however, because there was actually a dinner to prepare. So while the tagliatelle dried a tiny bit, I put on a big pot of water for the pasta and whipped up some of my Oma’s (i.e., grandma’s) tomato sauce. I actually look like I’m uttering some strange incantation while waving my hands randomly over the pot on the stove, but as far as I remember, no witchcraft or telekinesis was involved in the preparation of this meal. While I tended the stove, Jeremy set the table. 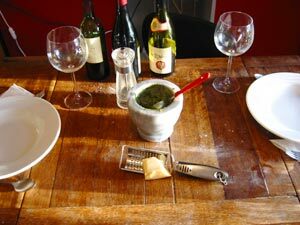 Here you can see my new mortar and pestle, filled with the freshly made pesto which was originally intended to be served with the vegetable soup that was supposed to be our main course after a pasta starter. Plans changed when we realized that we had enough pasta to feed an army. The soup had to wait for another day - but not the pesto. And yes, the kitchen table was still kind of covered with flour from the fresh pasta. What can I say? It’s rustic. …pour ourselves some wine and tuck in. The pasta was firm but tender, with a lot of body and a nice “mouthfeel”. It wasn’t gritty, it wasn’t mushy, it didn’t stick together, it didn’t fall to pieces when you twirled it on your fork, and the tangy tomato sauce clung to it perfectly, making every bite a little taste of heaven. It was just as good as it looks. And I can’t wait to do it all again! Good for you guys…what fun…and it looks so good that I wish we could just put our forks to the screen and join you. 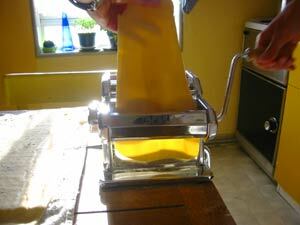 Do you happen to have a traveling bag for the pasta machine? :-) Not only did you master the machine, but also the correct attire for being the "pasta maker"!!!! All of this is a bit difficult to take right now when you just heard what WE’RE having for supper…. Enjoy, enjoy…. It is *really* hard to wait until the pasta has dried a bit first before trying to make the noodles - I, too, have had to clean out a massive mess of clumped-up dough from my pasta maker because I was too impatient to get to the noodle stage! 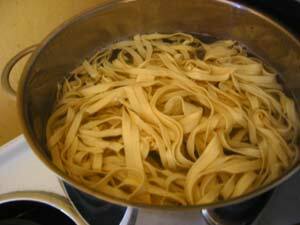 I’ve also found that if the dough is too soft to begin with, it’s hard to get the noodles to come out right. I think there was a good deal of beginner’s luck involved in my first attempt to make pasta, because I’ve had a couple of disasters since then (I’m not even going to mention my attempt to make ravioli…). But I’ve had some successes as well, and when you sit down to eat a plate of pasta that you’ve just made with your own hands - well, then all the floury, doughy mess is worth it. Good luck with the pasta-making - let me know how it goes! My family also had some problems, somebody told us that we didn’t need to let it rest/dry and we just put it through the pasta maker - turns out our pasta became white vermicilli pasta! Thanks for the tips/directions, now we can try it all over again! I teach pasta making classes and there are some hints to learn. 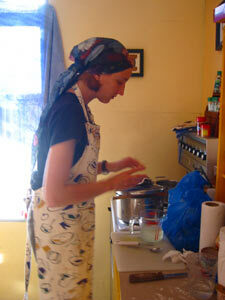 Firstly, it is a good idea to let the dough "rest" - it helps relax the gluten in the flour. 15 mins plus is OK or overnight in the fridge. 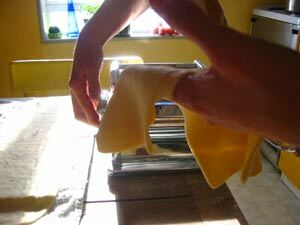 I like to dry the pasta - especially tagliatelle BEFORE cooking it. Make sure you make it rather thin - should look transparent - and not heavy. Dry it on floured tea towels. It can keep fresh for a couple of days or freeze it but don’t let it thaw out - cook it in plenty of salted boiling water straight away. It’s so quick and easy to make - that’s the whole idea of eating it fresh. There’s nothing like fresh lasagne either. Bon apetito. Thanks very much for the tips, Judi! 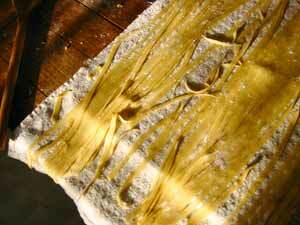 I have real problems making the tagliatelle thin enough - it all just seems to gloop up in my machine. I think I’m not letting it rest enough before cutting it. But I’ll keep working at it. 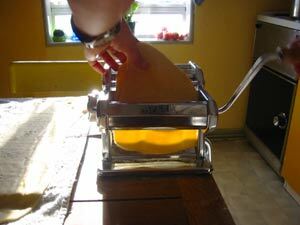 And I agree - there’s nothing like fresh pasta!